This is a tough game fantasy wise. You will want to start all of your Bengals even if it is Baltimore. Earlier this season Baltimore won 26-20. Not a lot of 'stats', but both of the running backs had respectable fantasy days. Rudi Johnson is a moderate start in this game, and with Jamal Lewis doing well you should put him in too. McNair has had success passing, and you always want to start Todd Heap. I'd assume all 3 of the Bengals WR are a start here. On any week they can have a huge game, and seemingly now every week Chad Johnson DOES have a good game. Palmer should have at least 2 TDs in this game. Not much advice here but to start who you have in this game. Also, not much news to report, but Priest Holmes definitely will not return to KC this year. I wrote an article before this was decided here . Now the news is official. Last week I was 11-5. Let's see what I get this week. Watch out for Campbell and Cooley for Washington, they've had some connections. Look for Indy to have another big game of course, and probably the Chargers. I expect the 49er/Saint game to be high scoring, I want to see Smith air it out. The Seattle game will be the most interesting though, wth Cutler playing. The game will depend on how Hasselbeck performs and if Alexander can run on a good run D.
Pratt will be posting his NFL Week 13 Predictions with a spread soon, so you can get two views on that. If your a fellow blogger like me, check out BlogAboutYourBlog. Get your blog exposed! I guess it took Hasselbeck a half to shake off his rust. He was terrible in the first half throwing a few picks and making bad decisions. He either played better in the second half, or the Packers D played worse. The clinch was that Alexander found a way to run all over them for 200 yards but no touchdowns. I still dont think Hasselbeck was a good play, but Alexander was pretty good. Next week Seattle plays Denver so the running game will have a tougher time. If you haven't given up on Vanderjagt on your fantasy teams, you better drop him now. The Cowboys cut Vanderjagt after he was only 13 of 18 in his field goal attempts. Hines Ward should also be moved to your bench. It was announced he will miss at least one game after arthroscopic surgery on his left knee. Dallas Clark may be seriously injured. He was scheduled for an MRI monday, but I haven't read any reports of the results. There has been speculation he tore a ligament in his knee. If Ben Utecht is available at TE in your league definitely pick him up! Ricky Proehl was signed by the Colts. I don't know how soon he will be playing but with Stokley injured most of the year, they need another receiver. With Dallas Clark most likely out of action there will be a need for Proehl and might be a moderate fantasy pick up. Chris Perry's return this season lasted only a few games when he broke his leg last Sunday. Perry will miss the rest of the season. Thankfully, Frank Gore's injury is not serious, and he only suffered two bruises on his right leg. No need to panick, he's a good start next week vs New Orleans. Thats it for now, in my next post's we will start looking ahead to the matchups and I'll make my NFL Week 13 Predictions. Write to FF_n_Stuff@yahoo.com if you need anything, questions comments or concerns contact me anyime. How good is the Vikings run defense? Good enough to not even want to try. Arizona had a combined 6 rushing attempts this sunday. You had to know Edge would struggle here, but he didn't even get to try. 6 Rushes along with 51 pass attempts! Matt Leinart had a decent game, not a great fantasy game though, unless you get a bonus for 300-400+ yards. He finished the game with 405 yards 2 picks, a fumble and a TD. I played Fitzgerald in hopes he would go off with a lot more looks and I was pleasantly surprised. 172 yards on 11 catches was more than I would hope for. Boldin owners also a pleasant surprise there. He hasn't had a game like this, until before Fitz was injured. Boldin added 9 catches, 140 yards and a touchdown to his totals. I woke up early enough to see Colston was out and I should get a pick up for my TE. Owen Daniels was the best option, but it didnt really matter, he only got me 3 points. Turns out I wouldnt need it but the real benefit of Colston being out was that I was a lucky owner of Devery Henderson. It also may be a good idea to get Copper if Colston misses more time. New Orleans has been airing it out like crazy. The Jets came back alive offensively but could be expected against the Texans. Pennington, Coles and Cotchery all had good game, though the running situation has gotten worse. To conclude my NFL Week 12 Sunday Wrap Up here are my Best and Worst Fantasy Starts of the Week. Tony Romo: Insane week for him 5 TDS! Otherwise I had a huge week in all of my leagues. Lucky lucky, going into playoff time. Good luck for everyone getting a spot. Colston, Perry, Clark, Gore... the list goes on! My picks are in bold, so far for the week I am 10-5 in my picks. Check out the rest of my Week 12 Predictions. I will post the other finals as they go, and another NFL Week 12 Results tomorrow, and hopefully a preview for Mondays game. Heartbreaking San Francisco loss. It was a chance for them to really turn around a bad start to the season. Frank Gore was a monster/beast in this game. He was constantly breaking tackles and rushing for first downs. Both running backs in this game were excellent fantasy starts. How is your fantasy team doing this week? Well coming in to Sunday I'm 3 for 3 on my Week 12 Predictions. Not really any upsets on Thanksgiving. McGahee is now a gametime decision so be cautious about wanting to start A Thomas vs Jacksonville. They have a decent defense, and even if McGahee is in, I don't know about starting him. Three broken ribs would slow me down. Try waiting to see how he plays, if he even starts. Hasselbeck is "expected to start" in the monday night game vs Green Bay. I've mentioned I'm really tired of this news. He's an okay start if he plays, if Seneca Wallace starts he's a GREAT start. With the rushing game not being what it can be with a Morris/Alexander combination, Seattle has the possibility to pass all over Green Bay. I'd start all D Jackson, Branch and Stevens. Brett Favre practiced friday and apparently looked good doing it. The only worry about giving him your fantasy start would be the problem of the longball. Favre and Driver seem to connect for big plays, and with a busted elbow that can take away that deep ball threat. Seattle doesn't have a particularly good passing defense, so Favre should be a safe start regardless. Ronnie Brown had surgery on his broken left hand. There is no timetable how long he will be out, but before the surgery he had said he hopes he can play through it. San Diego Chargers defense has been struggling, and not just because Merriman is suspended. Luis Castillo has been out with an injury and is expected to miss yet another game this week. He has the most sacks as a lineman this season, with him out they lose a considerable amount of run stop and pass rush. I've read a few questions about people wanting to start S Alexander. One question was C. Taylor or Alexander? In a heartbeat I would have to go Taylor. First, Taylor is playing Arizona. Second, Alexander really hasn't proven himself all year. Especially coming back from injury against the 49ers he was held to 2.2 yards per carry. I would be concerned starting Alexander. The Tennessee Titans will be 41 million dollars under the projected salary cap next season. Definitely watch them to be a lot better team next year. With the possibility of high draft picks and free agent money, they could be a decent team. We all know LT is good and has been crazy with TD's. That definitely overshadows how many yards he's been getting. The thing is he is doing it with so little carries, this stat is crazy. In the past four games, Tomlinson has 9 more yards than Larry Johnson, and 30 fewer carries. WTF? Thats pretty annoying, next time I won't include NFL in the title, I think that did it. My other video is just fine. Well I've tried to capture a "play of the week", but what most impacted fantasy football this last week were injuries, so thats what my video was about. I hadn't seen Favre until this so here goes. Turn up the volume if you want to hear my low whisper lol, it was late. Remember its just me shooting off of my digital camera since I don't have the cords for TiVo yet. I haven't been feeling too well lately, so I haven't been posting. I actually went out on Monday night so I didn't catch the whole game, but what a disappointment. So here is a few things to keep in mind this week. Apparently the Dolphins defense is for real, and Detroits defense has been non-existent. Be careful starting your Lions, although I have to roll with Kitna this week in place of McNabb. Caddy Williams hasn't been a good start until last week. He won't do the same against Dallas who is ranked 4th against the run. San Diego's defense hasn't been the same for a while. All I hear is because of Merriman but he's not that huge of a force. Along with Merriman, Shaun Philips, Jamal Williams, Marlon McCree, and Luis Castillo are all injured. Although Castillo may return he missed 2 games. The Chargers defense besides that isn't particularly good at defending the pass. Is this the week to actually start Randy Moss? I'm saying he has a decent day. Take a look at Pratt's starts and sits, I won't be doing that yet. Ill try to get a summary of the Thanksgiving games after they happen. I should get to see them all. Quarterback: Matt Leinart (ARZ). Arizona got a much needed win last week. By "much needed" I mean for their confidence. This week they are playing the Minnesota Vikings who have a horrible passing defense (ranked 26th in the league), and Leinart certainly has the weapons around him to post some strong numbers. Look for Fitz to bounce back, and to give Leinart a good game. Running Back: Wali Lundy (HOU). Lundy is going up against the 29th ranked rushing defense in the league (the NYJ). The Jets are allowing 146 yards a game, and have allowed a league-high 13 rushing TDs. He should have a great game this week. Wide Receiver: Chris Chambers (MIA). Miami's offense is finally starting to click. I mentioned in my earlier post that Harrington might not be a bad pickup if you are weak at QB. Detroit is 22nd in passing defense and Miami usually plays well on Thanksgiving. Tight End: Jerramy Stevens (SEA). This one might be wishful thinking because I need a good game out of him this week. Green Bay is 31st in passing D and has given up 18 passing touchdowns this season. Look for both Seattle's running and passing game to get back on track this week. Defense: Carolina Panthers. The Panthers finally had a strong defensive game last week, shutting out the high powered St. Louis offense. They should have an easier time controlling the game in Washington, and should post similar numbers to last week. My sit this week belongs to Thomas Jones (CHI). Jones is going up against the 2nd best rushing defense in the league (NE). New England has only allowed 5 rushing TDs this season, and will shut Jones down all day. Jeff Garcia (PHI) - He did a pretty good job last week when Donovan McNabb went down, and playing the Titans should have helped him get some rhythm back. It is not definite that he is going to start this week so be weary. I think he will get the nod though. Trent Green (KC) - Many of his owners got frustrated by how long it took Green to recover from his injury and were forced to drop him. If he is still on your waiver wire, pick him up he will be a good addition to your team. Joey Harrington (MIA) - He might not be a permanent solution, but if you are panicking with a short week ahead of us, he is a nice option against a poor Detroit Lions defense. J.P. Losman (BUF) - I'd only pick him up if he is a last resort for you. Losman has a really tough schedule ahead of him (in his next 4 games he plays Jacksonville, San Diego, and New England). That may force him to throw a lot though, but he still would be a risky start. Justin Fargas, RB (OAK) - LaMont Jordan could be out for the rest of the season, and any starting running back is usually good to have for insurance. I've like him all season, he is a strong runner and could have some room to run with Aaron Brooks back at QB. Reche Caldwell, WR (NE) - Over the last few weeks he has been emerging as the number 1 WR for Tom Brady. He had 70 yards receiving and a TD last week against Green Bay. Just heard some heartbreaking news on CBS. Donovan McNabb has a torn ACL and is out for the season. Now its a scramble to pick up anyone to try to save the season. 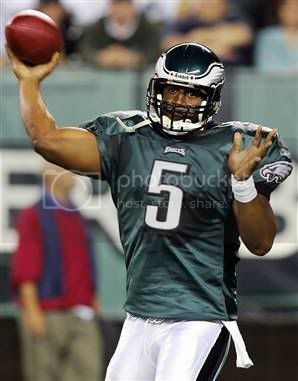 Time to say farewell to McNabb, great half of season. In my smaller leagues I will probably grab Romo, and in my deeper leagues it may be McNair, Campbell, or Harrington. I'll let you know who I go after. You heard it here first, Donovan McNabb is officially a Fantasy Football Drop. Tons of injuries to report, I'll do that first then a few start and sits. I have a few close calls, let's see if it pays off. Greg Jennings practiced Friday and is expected to play Week 11. He was limited last week which meant a big game for Driver. If he continues to work back in slowly, Driver could go off again. Don't start Jennings just yet until he shows he's 100% back. Terry Glenn practiced Friday and will play in week 11. Don't play Crayton again just yet. The Colts pass D is a lot better than the run D. Expect huge games from the Dallas Running Backs, and maybe T.O or Romo. Glenn and Crayton will probably not as involved. Witten is a good start. Horn was upgraded to probable yesterday for the Cincinnatti game. Horn could possibly be a huge start alongside Colston. San Diego Charger WR's had big games against Cin and most people hadn't heard of them. Horn practiced this week so its a safe bet that he will play. Byron Leftwich will have surgery on his left ankle which may end his season. The Jaguars are optimistic about the surgery, however, and said he may still return this season. With this news it's certain that he won't be back soon, so therefore I will be dropping Wilford, with Garrard as QB. I picked up both Wilford and Garrard last week playing the matchup, and I lost. I suggest you do the same if you have them. It has become an even more difficult game for Campbell and it hasn't started yet. Santana Moss was downgraded to doubtful. There is only "some slight hope" he will play this week. Corey I hope your reading this, don't start him! Lol. Rueben Droughns will be a game-time decision, but this shouldnt matter much in fantasy football, I wouldn't expect anyone to start him vs Pitt. Ray Lewis has been officially ruled out for Week 11. Vick can breathe a small sigh of relief. The Ravens D is defiinitely tough without him, but he will be missed. Last but not least, Hasselbeck and Alexander. I'm tired of all the reports about them. I could really care less if they are or are not playing since I have neither on any of my teams. I wouldn't personally start either one this week. Thats hard to say considering its the 49ers, but I stand by that decision. They may or may not play, they are both gametime decisions. At Quarterback I'm sitting Chad Pennington vs the Bears and I'm playing McNair. I grabbed McNair for Garrard earlier this week. At Running Back I'm starting S. Jackson over C.Taylor (small league). I'm also sitting Tatum Bell and Warrick Dunn in another league. I may start Edwards in a flex over Dunn, trying to play the matchup hoping to get lucky. Bell is a risky play with his toes and all those Running Backs in Denver. Dunn has become less involved in the running game, and the Falcons have a tough game against the Ravens this week. These aren't all on one team, just a combo of a few. Cotchery and Coles may be limited if Pennington continues to not play as well as he has. I'm hoping Fitz can have a huge game against the Detroit Defense, same thing goes with Stallworth. Burress is a must play, since besides Shockey he is now the main target. Come on Eli Manning don't fail me now. I'm also sitting Muhsin Muhammad in one of my leagues in favor of Burress I believe. With Berrian possibly coming back, Muhammad is a tough fantasy player to start. Muhammad has his best game with Berrian out, with him in he gets a lot of looks taken away. Thanks for reading this really long post. Sorry I have been so light on my posts lately. I was sick/busy last weekend and this whole week I've been in Las Vegas!!! Of course it was for business, but it is damn near impossible to not have fun here. Being a geek at heart, I can't resist putting up at least one post while I'm away. Here are my starts and my big sit of the week! Quarterback: Joey Harrington (MIA). The Vikings are 26th against the pass, and this Miami team is finally starting to come together. I expect this to be one of Harrington's top performances of the season. My guess is 250 yards and 2 TDs. So if you are having match ups issues (like Eli Manning vs. Jacksonville), Harrington should be a good start for you. Wide Receiver: Braylon Edwards (CLE). Talking trash is never good karma before a big divisional game, but bad karma can't even prevent the Pittsburgh secondary from giving up big and many passing plays. Look for Cleveland to be airing it out against a suspect Pittsburgh passing defense, and Edwards to be good for 100 yards and a TD or two. Running Back: Anthony Thomas (BUF). In his last two games, Thomas has rushed for over 200 yards and a touchdown. His opponent this week, the Houston Texans, is ranked 27th in run defense and has given up 10 rushing touchdowns. I think Houston wins the game, but I expect Thomas to put on a great show. Tight End: Chris Cooley (WAS). With Mark Brunell finally out of the picture in Washington, I think this is the week for Cooley to shine. Look for Jason Campbell to be dumping off to Cooley often, and finally...finally...utilizing the weapon they have in Chris Cooley. Defense: Seattle Seahawks. Last time I did my starts and sits, I told you to start the Seahawks and they put on a great show. The Seahawks D isn't the best in the league, but when the match up is right they really bring their A game. The 49ers are ranked 26th in total offense and their main man, Frank Gore, is banged up. Look for them to put up some great numbers again. My SIT this week belongs to Plaxico Burress. Plaxico is Eli Manning's main weapon with Toomer out, and so he is drawing the best defenders. This week is no different. Burress will be covered by one of the best corners in the league, Rashean Mathis. Last week against Chicago Burress only put up 4 catches for 48 yards...I expect similar numbers this week as well. If you picked up Ladell Betts for your fantasy football team you will definitely be glad that you did that. He is turning into a bigger fantasy pickup than I thought. If you haven't its definitely time to pick him up before some else gets him. I'd call Ladell Betts the sleeper of the week, but he's gotten a lot of hype he may not even be able to be called a sleeper. If you havent gotten the news yet, Clinton Portis was placed on the Injured Reserve (IR) today ending his season. Portis' most recent injury, a broken right hand, is his fourth injury of the year. Expect Betts to get a lot of carries this week. Washington will need to get a run game going earlier if Campbell will have any success. Like I've said, this game shouldn't be high scoring at all, and the defenses might actually be good to start. Tampa Bay (2-7) and Washington (3-6) won't put up spectacular numbers, I just hope I don't have to watch this game Sunday! ESPN just reported that it will be Trent Green starting over Huard. Huard has been a tough start, being an inconsistent fantasy football quarterback. I think it's safe to drop him. Should you pick up Trent Green? If your desperate. He may have a good game, but he also may pick up where he left off which wasn't too great. I'd like to touch on the Vinny Testaverde signing. 43-year-old Testaverde was signed by the New England Patriots. I read about this on Everything But Hockey, and I thought it was some sort of joke. I had to check NFL.com to make sure it was real. Does he hold any fantasy football value? No, none at all. Doesn't matter though, just seems odd. Who wouldn't come back? If I was Testaverde I would. Sit on the sidelines and just make money, lol. Speaking of irrelevant to fantasy football, how about Emmitt Smith?! Man he was getting down last night. I usually don't watch it, but my girlfriend was so I had to turn around to see what Smith was doing. The best face off would be Jerry Rice vs Smith. They even had them both on ESPN talking about it, lol. Enough about all that. I've been around on a few forums, I've added them to the links on the right column. Don't be shy check them out. I may post some future articles on these sites, we'll see what they want to do. Not much else to report, anything you'd like to see please feel free to contact me. Tomorrow I will have a list of Sundays injuries and the impact, as well as a little review of the Tampa Carolina game, from what I saw of it. What do you think about starting Wali Lundy this week? On my bench I have Rudi Johnson, Julius Jones, and THomas Jones. i am also starting Chester tAYlor along sid Wali right now. Wali didnt do that great against the Giants run D, but that was expected considering they also shut down julius jones and marion barber (the week i started him.....) and the Jags have a less than stellar D this year altogether. The inconsistency of my bench has led me to this question. i have a whole bunch of wrs who havebeen pretty inconsistent too, and injury prone. I currently have Keyshawn, Braylon, Holt, Coles, Santana Moss, Brandon Jones, and James Thrash. I am able to start 4. Jacksonville's rushing defense actually isn't that bad. They are allowing just under 100 rushing yards (98.1) per game. They've also only allowed 4 Rushing TDs and 3 rushes fo 20+ yards. I don't know about starting Lundy. Lundy has about two good weeks under his belt opposed to a whole year of really not getting the ball. With this inconsistent team your worried about you shouldn't play him now. I wouldn't expect Lundy to play better than either of the Jones's or R. Johnson. Johnson didn't do so bad against Baltimore, and SD is banged up. They couldn't contain the Browns! J.Jones is against Arizona, I'd expect close to 100 yards, just gotta worry about Barber taking the TDs. I don't particularly care for the Bears RBBC so I'd go with Rudi here definitely. He's starting on my team, and I'm hoping he will be a solid start. Ouch, those 4WRs are a tough start. After Holt you can have 3. Id rank them in order of about... god... uhh Keyshawn, Coles, Moss/Edwards and the rest. These are the most inconsistent WRs you can have lol. It all depends on Delhomme involving Keyshawn. Against Tampa I think they will do fine. Coles is the man in NYJ so I guess you got to start him. If Pennington can get him the ball he can be good. If not theres not much else a WR can do to get involved. With Penningtons poor showing as of late, it's a hit or miss here. Moss should play but he's so hard to start. Edwards I think will continue to get more and more involved especially with his teammates injured. I wrote about the Browns in a blog you can see there. But mostly I think they are gonna give Frye more control, which should involve Edwards more. As an Edwards owner I hope this is the case. This is just what I would do with your team, but its hard to say with your WRs. Maybe you could get a more consistent WR for Jones or Jones. Maybe someone will bite if you want like D Jackson, Fitz/Boldin and they need a decent RB starter. I Hope I could help. Thanks for your question Corey and I hope I steered you in the right direction! Amani Toomer is injured so who should I get? If you want a NY Giant I'd grab Tim Carter. If you want a possible fill in for the week, Patrick Crayton for Dallas might be good. Horn has been downgraded to Doutbful, so there is an open spot in N.O that should be going to Devery Henderson. I'm just throwing some possible WRs out there for you but I think these would be some decent starts. A few weeks ago I couldn't trade this guy for a top kicker or even a decent TE. Now with this second emergence of the running game, I'm recommending starting him in quite a few situations this week. 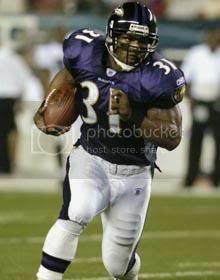 Jamal Lewis should be a solid start this week against Tennessee. Plugging him in your #2 RB slot or Flex should be a good choice. I've been on yahoo answers a bit today seeing a lot of J. Lewis questions. Here's what I said to one answer. J lewis has become more involved in the offense, example the last two weeks 109 yards, and 72 yards 1 td. I don't see why that wouldn't stay the same, I'd expect Baltimore to pound it against the Tenn, they shouldn't have a reason to really air it out. I'd predict about 25-30 carries 100 yards and 1 td. I personally don't think I will be starting him over S. Jackson and Dunn but he's a definite possibility for other teams. Well I dropped Amani Toomer yesterday in my FleaFlicker league. I've got a ton of "decent" WR's but no STUDs. Just another bust, now I just added Edwards, not really an improvement lol but something. Amani Toomer has a partial tear in his left knee, so hes definitely done for. With Burress's back problems, and Toomer out NY Giants are really hurting with their wide receivers. 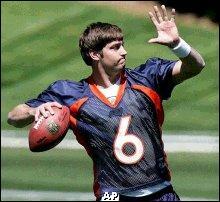 This should make Shockey a HUGE start if hes their only target vs the Bears next week. I'll write up two more running backs then finish the rest on my list tomorrow. McGahee is definitely out for this Sunday's game, and I'd assume longer. I saw on ESPN he has THREE broken ribs. There currently isn't a timetable at the moment as far as I've read. It all depends on how long it takes for him to heal. Thankfully I didn't end up trading for him. A. Thomas is definitely a good fill in for the time being if you have an open slot. What kind of post would this be without mention of the Denver RB's? It was a huge fantasy question in the beginning until Tatum Bell broke out. Now with his injury Mike Bell is getting some carries again. He was completely shut out last week against Pittsburgh. On 17 attempts he only rushed for 28 yards and catching 5 balls for 40 yards. I suppose not much was expected VS Pitt but that was only 1.6 yards a carry. Tatum Bell was held out of Week 9 but he did practice today and is expected to practice tomorrow. There hasn't been word yet if he is playing this weekend, but if hes practicing it's definitely promising. Denver is playing Oakland this weekend, so if there is a definite starter you will probably want to throw them in there. As a Tatum Bell owner he will probably see the bench for me again this week, mostly because I'm stacked at RB and cant chance him having a good game or not. On a parting note, I saw this thing on myspace while I was trying to promote this site. Someone is making a movie about Fantasy Football, and the Fantasy Football craze. Heres there link if you want to check them out http://www.10yardsmovie.com/site/ . I already dropped them an email if they are interested in checking out the site. Can't hurt, enjoy! GameDayDraft.com is expanding and soon will have FIVE other fantasy sports. Theres real money games as well as games just for fun. Along with contests that offer real cash prizes with no entry fee. This week they are starting up fantasy basketball. I know a few people I've talked to mention wanting to get a basketball league together, this is even better. In other news Im working on some guest posters :) Hopefully we will see one in the next few days. Im working on getting some more football stuff up. Lots of injuries. Keep reading!